James Lusk Alcorn was a prominent American political figure in Mississippi during the 19th century. He was the leading Scalawag during the Reconstruction in Mississippi, where he served as governor. He briefly served as a Confederate general during the early part of the American Civil War. Scalawag was a term used to describe a white Southerner working for or supporting the federal government during Reconstruction. They formed a coalition with Freedmen (former slaves) and Northern newcomers (called Carpetbaggers) to take control of southern state and local governments. Some of the more unscrupulous scalawags truly believed that if they united with the Reconstruction over time the South would return to original law. Others simply saw the opportunity to make a lot of money stealing from the state treasuries. Scalawags who continued to support the Northern Republicans after the army was positioned in the South became the target of hatred. 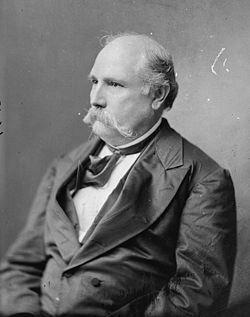 Two of the most prominent scalawags were General James Longstreet (Robert E. Lee's second in command), and Joseph Emerson Brown, the wartime governor of Georgia. Those who had not supported the Confederacy were eligible to take the "ironclad oath," as required by the Reconstruction laws in 1867, to vote or hold office. In the 1870s, many switched from the Republican Party to the conservative-Democrat coalition, called the Redeemers, which defeated and replaced all the state Republican regimes by 1877. In South Carolina there were about 10,000 Scalawags, or about 15 percent of the white population. During its heyday, the Republican coalition attracted some wealthier whites, especially moderates favoring cooperation between open-minded Democrats and responsible Republicans. Rubin shows that the collapse of the Republican coalition came from disturbing trends to corruption and factionalism that increasingly characterized the party’s governance. These failings disappointed Northern allies who abandoned the state Republicans in 1876 as the Democrats under Wade Hampton reasserted conservative control, using the threat of violence to cause many Republicans to stay quiet or switch to the Democrats. The most prominent Scalawag was James Lusk Alcorn of Mississippi. He was elected to the U.S. Senate in 1865, but, like all southerners, was not allowed to take a seat while Congress was pondering Reconstruction. He supported suffrage for Freedmen and endorsed the Fourteenth Amendment, as demanded by the Republicans in Congress. Alcorn became the leader of the Scalawags, who comprised about a third of the Republicans in the state, in coalition with carpetbaggers and Freedmen. He was elected by the Republicans as governor in 1869, and served from 1870 to 1871. As a modernizer, he appointed many like-minded former Whigs, even if they were Democrats. He strongly supported education, including public schools for blacks only, and a new college for them, now known as Alcorn State University. He maneuvered to make his ally Hiram Revels its president. Radical Republicans opposed Alcorn and were angry at his patronage policy. One complained that Alcorn's policy was to see "the old civilization of the South modernized" rather than lead a total political, social, and economic revolution. He resigned the governorship to become a U.S. Senator (1871-1877), replacing his ally Hiram Revels, the first African American senator. Senator Alcorn urged the removal of the political disabilities of whites southerners and rejected Radical Republican proposals to enforce social equality by federal legislation he denounced the federal cotton tax as robbery and defended separate schools for both races in Mississippi. Although a former slaveholder, he characterized slavery as "a cancer upon the body of the Nation" and expressed the gratification which he and many other Southerners felt over its destruction. The term was originally a derogatory epithet but is now commonly used by all historians. A curious assortment of native Southerners thus became eligible to participate in Radical Reconstruction. And the number increased as the President granted individual pardons or issued new proclamations of amnesty. Their primary interest was in supporting a party that would build the South on a broader base than the plantation aristocracy of ante-bellum days. They found it expedient to do business with Negroes and so-called carpetbaggers; but often they returned to the Democratic party as it gained sufficient strength to be a factor in Southern politics. Scalawags were denounced as corrupt by Redeemers. The Dunning School of historians sympathized with the claims of the Democrats. Agreeing with the Dunning School, Franklin said, that the Scalawags "must take at least part of the blame" for graft and corruption. "But their most serious offense was to have been loyal to the Union during the Civil War or to have declared that they had been loyal and thereby to have enjoyed full citizenship during the period of Radical Reconstruction." The Democrats, who were the conservatives of the Reconstruction era, alleged the scalawags to be financially and politically corrupt, and willing to support bad government because they profited personally. One Alabama historian claimed: "On economic matters scalawags and Democrats eagerly sought aid for economic development of projects in which they had an economic stake, and they exhibited few scruples in the methods used to push beneficial financial legislation through the Alabama legislature. The quality of the bookkeeping habits of both Republicans and Democrats was equally notorious." However, historian Eric Foner argues there is not sufficient evidence that scalawags were any more or less corrupt than politicians of any era, including Redeemers. In terms of racial issues, "White Republicans as well as Democrats solicited black votes but reluctantly rewarded blacks with nominations for office only when necessary, even then reserving the more choice positions for whites. The results were predictable: These half-a-loaf gestures satisfied neither black nor white Republicans. The fatal weakness of the Republican party in Alabama, as elsewhere in the South, was its inability to create a biracial political party. And while in power even briefly, they failed to protect their members from Democratic terror. Alabama Republicans were forever on the defensive, verbally and physically." Social pressure forced most Scalawags to join the conservative/Democratic Redeemer coalition. A minority persisted and formed the "tan" half of the "Black and Tan" Republican party, a minority in every southern state after 1877. White Southern Republicans included formerly closeted Southern abolitionists as well as former slave owners who supported equal rights for freedmen. (The most famous of this latter group was Samuel F. Phillips, who later argued against segregation in Plessy vs. Ferguson). Included, too, were people who wanted to be part of the ruling Republican Party simply because it provided more opportunities for successful political careers. Many historians have described scalawags in terms of social class, showing that on average they were less wealthy or prestigious than other whites. The mountain districts of Appalachia were often Republican enclaves. They had few slaves, poor transportation, deep poverty, and a standing resentment against the low country politicians who dominated the Confederacy and conservative Democracy in Reconstruction. Their strongholds in West Virginia, eastern Kentucky and Tennessee, western Virginia, and North Carolina, and the Ozark region of northern Arkansas, became Republicans bastions to the present day. These rural folk had a long-standing hostility toward the plantation class; they had harbored pro-Union sentiments during the war. Andrew Johnson was their representative leader. They welcomed Reconstruction and much of what the Radical Republicans in Congress advocated. As Thomas Alexander (1961) has shown, there was a persistent Whiggery (support for the principles of the defunct Whig Party) in the South after 1865. Many ex-Whigs became Republicans who advocated modernization through education and infrastructure—especially better roads and railroads. Many also joined the Redeemers in their successful attempt to replace the brief period of civil rights promised to African Americans during the Reconstruction era with the Jim Crow era of segregation and second class citizenship that persisted into the 20th century. He found the higher the score the more likely the person was a Scalawag. ↑ Lillian A. Pereyra, James Lusk Alcorn; Persistent Whig (Baton Rouge: Louisiana State University Press, 1966). Pereyra, Lillian A. James Lusk Alcorn; persistent Whig. Baton Rouge: Louisiana State University Press, 1966. This page was last modified on 4 April 2008, at 00:56.